If you’ve ever wanted to get your game friends something special or tried to help out a guildmate and found yourself hampered, the game shop has just become a little bit better. Blizzard has now added a way to gift Blizzard Balance to your BattleTag friends. While you’ve been able to send digital items as gifts for a while, game services like character transfers or race changes were a hassle. Simply head to the Blizzard Shop, navigate to the upper right hand corner where your Blizzard Balance is displayed in green numbers, and click on it to open the drop-down menu where “Add/Gift Balance” is the first option listed. 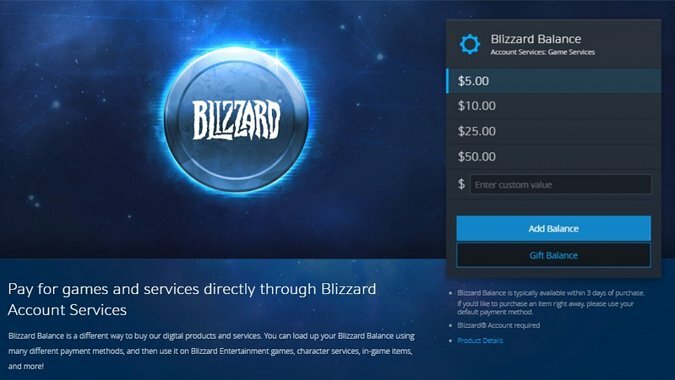 You can purchase Blizzard Balance in pre-set amounts or even fill in your own value. One caveat: There are two buttons to check out, and “Add Balance” is already highlighted while “Gift Balance” is directly under it and easy to miss. Clicking “Add Balance” will try to add the amount to your own Blizzard Balance. “Gift Balance” will take you to another screen to choose your lucky friend. From that option you then choose a Real ID or BattleTag from your list of Blizzard friends and a custom message if you so please, before heading to the payment page. Blizzard Balance can only be purchased with a credit card or PayPal — whether you’re purchasing it for yourself or gifting it to a friend. Unfortunately, there is no way gift Blizzard Balance using your WoW gold. Once you purchase a WoW token, you can only redeem it for your account. You can’t transfer the balance between accounts or use it to gift Blizzard Balance to someone else. If you have a lot of gold sitting around, however, you can still manually give your friends gold to buy their own token, unless they don’t have a WoW sub or are the kind of proud person you have to force gifts on. One unintended effect of this change is that it makes it easier to buy certain things like raid carries for real money. However, real money in exchange for in-game transactions from someone else is still against the ToU and unsupported if one should ever get burned in such a deal.